Before I left for Virginia (yes, I’ll blog about that later), I joined Tucson Museum of Art’s Contemporary Art Society for the annual Phoenix Art Tour. We toured an art gallery, an art studio, and Taliesin West. 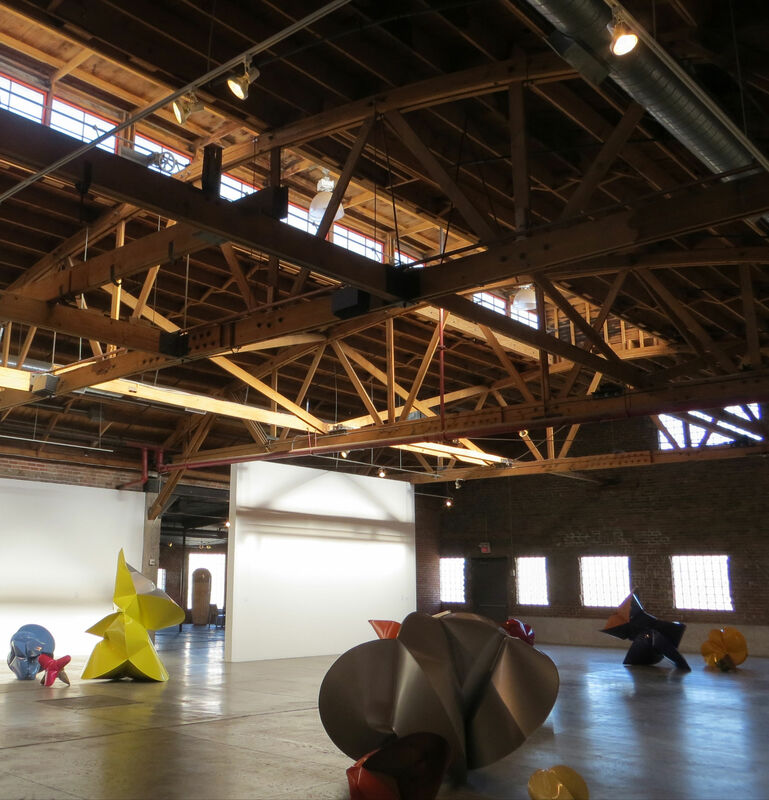 The Bentley Projects Gallery (synonymous with significant contemporary painting and sculpture in the Southwest), was once a linen laundry warehouse dating back to 1918. 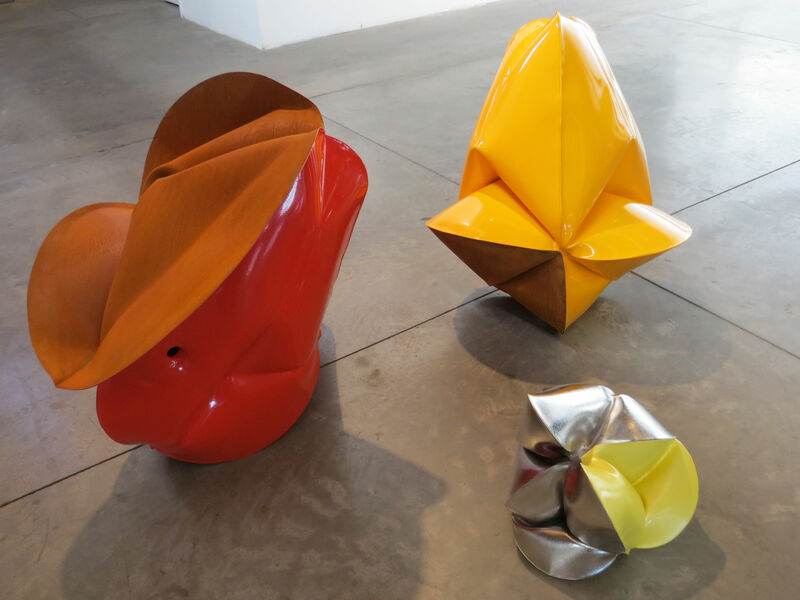 Jeremy Thomas’ inflated metal sculptures were pretty awesome. Each piece begins as welded circles of plate steel, which are then placed in a forge furnace and heated until malleable. (At Hades-like temperatures, about 2000° F, metal can be molded like clay.) 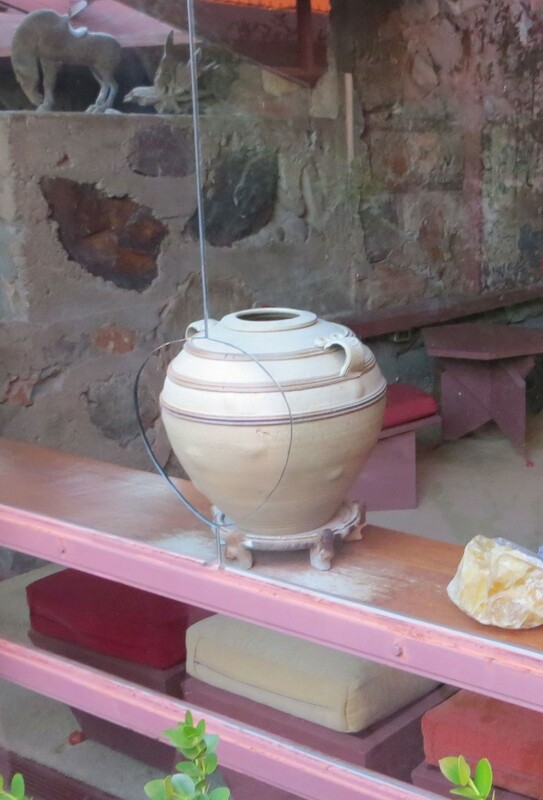 The piece is then removed from the furnace and injected with bursts of pressurized air. Most of the volume is powder-coated in bright, primary colors that reference farming machinery, while the rusted side gets an oxide patina, creating a soft, leathery contrast to the hard, shiny surfaces. 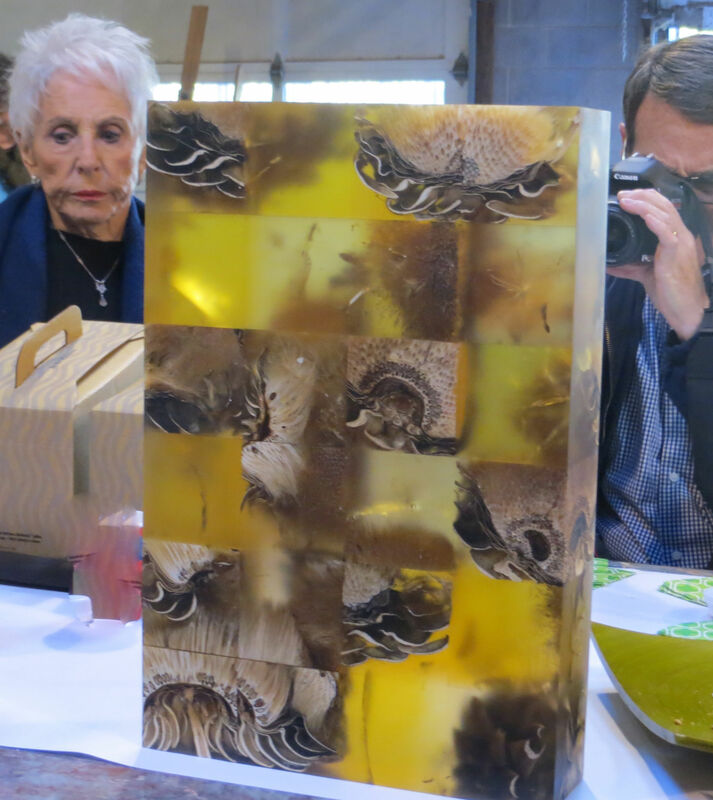 Mayme Kratz works both in resin and blown glass. 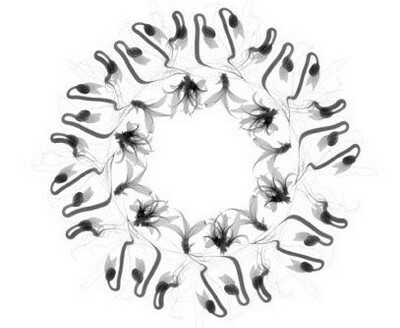 Her pieces are intended to capture nature in transparent structures. 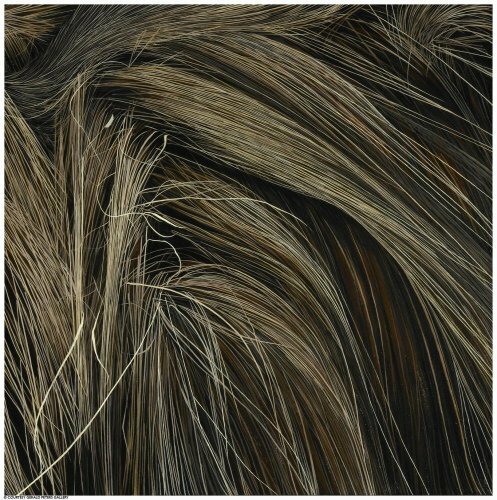 Her studio was full of grass works that she has done for Tucson Museum of Art’s exhibit, Desert Grasslands, which shall open January 26. 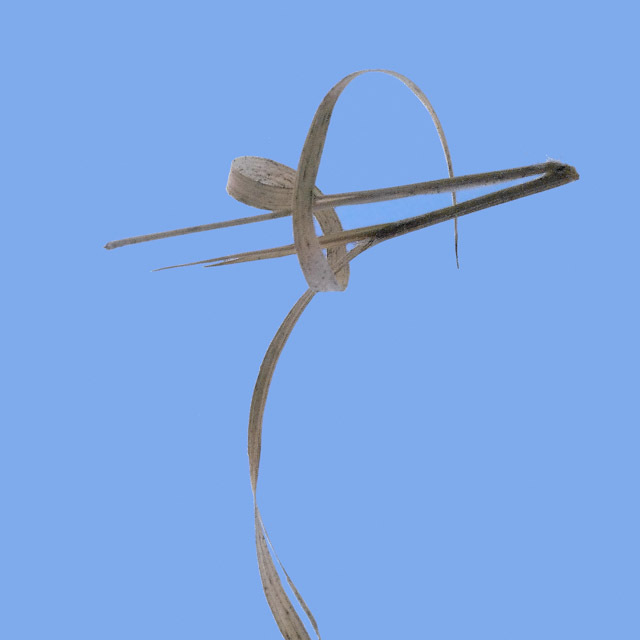 Above are birds’ nests that she created out of grasses then encased in resin. 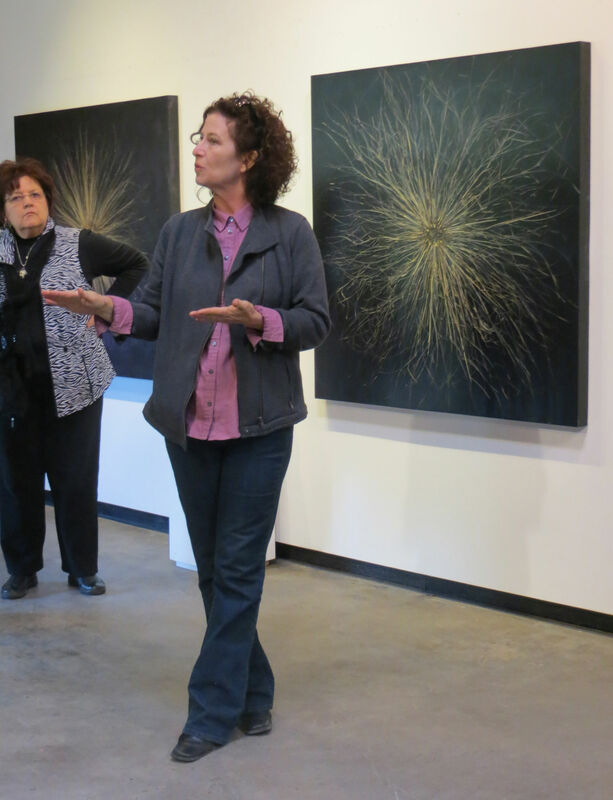 To the right is her talking about her work, with grasses laid out as a sunburst in resin. 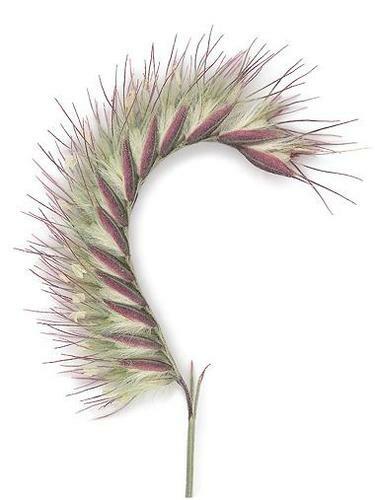 My favorite was this one made from thistle. Late in the afternoon we drove to Frank Lloyd Wright’s Taliesin West, way to the northeast of Scottsdale, now in the McDowell Mountain Regional Park, for our tour. It had been ten or fifteen years since I’ve been there. Wright positioned the home on the “brow” of a hill, rather than on the peak so that Taliesin would appear as though it arose naturally from the landscape. In his words, “…not on the land, but of the land”. In Wisconsin, however, the hill is eroding away from the buildings. In the restoration process they are using using reinforced concrete piers and beams to tether the house to the bedrock; otherwise Taliesin might slip down the hill. 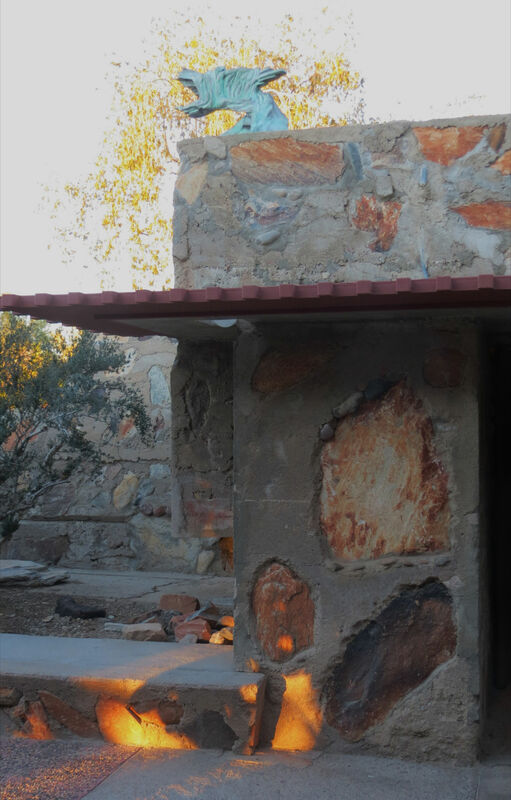 Wright started Taliesin West in 1937. (2012 was the 75th anniversary, good time for a fund drive for renovations.) With the Fallingwater commission he paid $2,000 for 600 acres of desert (less than $350 an acre), way out of town and with no utilities. He bought well water from nearly ranchers and carted it to his site in barrels. His students dug in a road. They were really dedicated – check out the length of that road! (The dark squares to the left are solar panels which power the complex, costing $1.1 million, but donated by First Solar last year.) 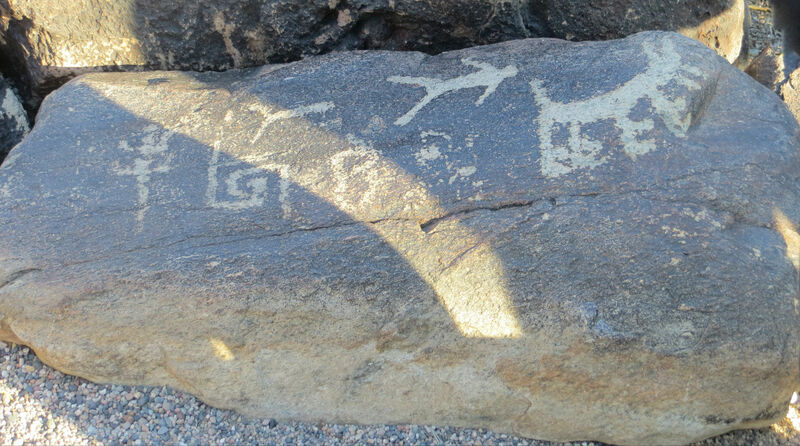 They found many Hohokam petroglyphs, which are displayed around the site. It seems I was trained wrong, by parents with a Depression mentality who had so little money that they shared the purchase of a wheelbarrow with my aunt and uncle. Wright, on the other hand, said Take care of the luxuries and the necessities will take care of themselves. Darn, why didn’t I think of that? The ceilings at Taliesin were originally canvas, to give diffuse light. The view at Taliesin West was so integral to its success that when power lines appeared in the distance in the late 1940s, Wright wrote President Harry S. Truman, demanding they be buried. It was a losing battle. So after briefly considering rebuilding in Tucson, he “turned his back on the valley,” and changed the entrance to the rear of the main building. Eschewing the poles, Wright refused electricity until 1949. The canvas leaked when it rained and was shredded by the desert sun, so had to be replaced every year. They finally used acrylic sheeting over the fabric (now Sunbrella I think). This photo of mine shows the low ceilings, the roof of canvas, and one of his weirdly-shaped doors in the Visitor’s Center. The trusses of redwood dried out so much that they were replaced with Douglas-fir. That, however, did not take the stain the same as the rest of the redwood, so all of the wood was painted Taliesin Red. Now the trusses are being replaced by steel as the doug fir has not held up well to Phoenix’s summer either. I have a page of notes from the tour. 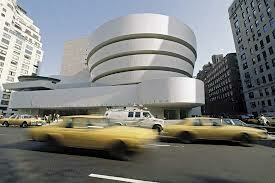 For example, Wright worked on the Guggenheim Museum design for 17 years! It opened in October of 1959, six months after his death. 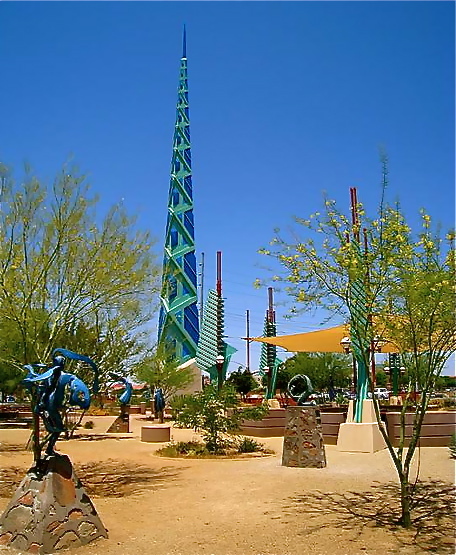 His design for the State Capitol Building in Phoenix was never built, but the design for the spire was bought and it was erected in Scottsdale’s Promenade shopping center in 2004. 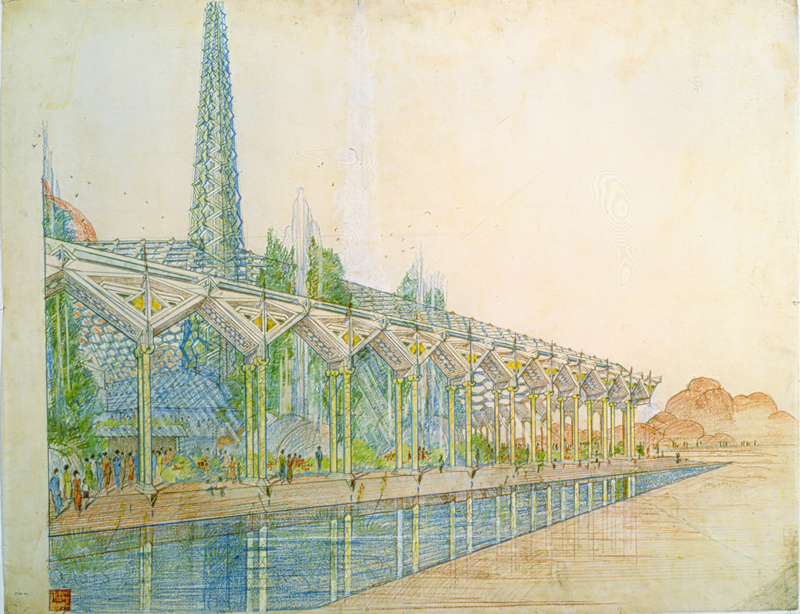 The sale of his plans help support the Frank Lloyd Wright Foundation. 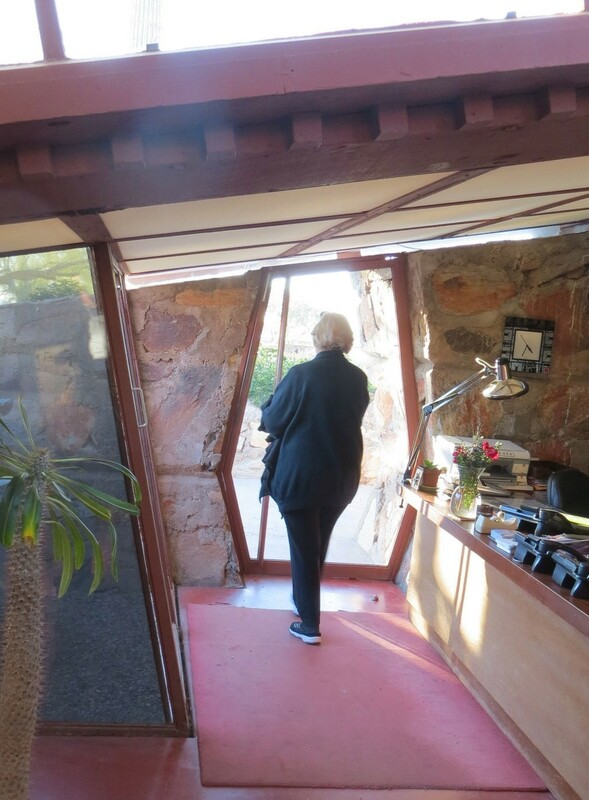 Taliesin West is still an architectural school. Every Saturday night everyone would dress in gowns and tails. The students gave concerts to Wright and his wife. If one of them didn’t know an instrument, his wife would teach them. The concrete work is very rough, but pretty awesome with the six- or eight-man rocks, which had been loaded into slanted wood forms. However (there seem to be a lot of however), the concrete mixed from sand on the site retains water. Wrights’s paperwork had to be moved from what had been a storeroom. 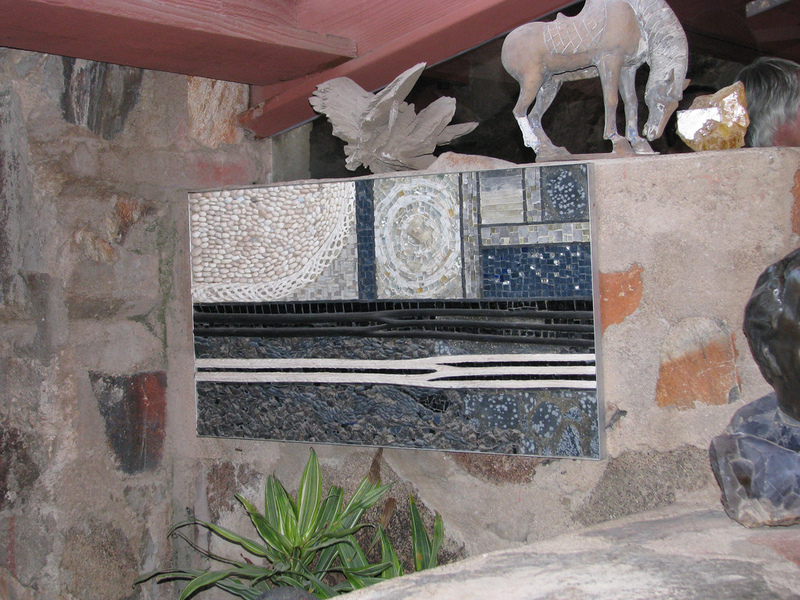 This photo of mine of a stone and concrete wall shows a dragon that Wright sent his wife from Japan. It was supposed to spout water into a fountain, but his wife said that no self-respecting dragon would do that, hence its location atop a roof. 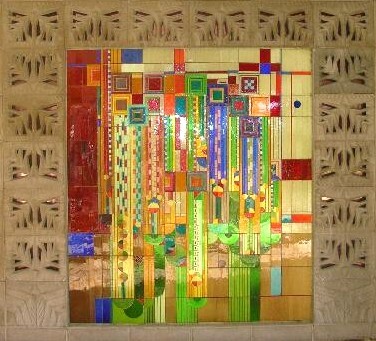 Clare Boothe Luce, American editor, playwright, social activist, journalist, ambassador, and congresswoman, as well as Wright family friend, also did mosaics, incorporating many natural desert materials. 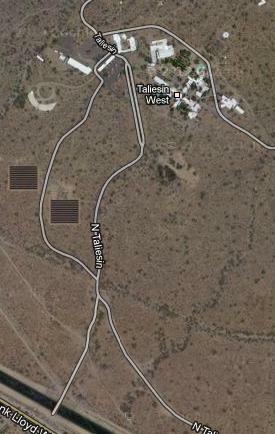 She gave Desert by Day and Desert by Night to Taliesin. (These photos are from the Web, since we were not allowed to take photos inside the Garden Room.) Wright became famous in 1938 after her husband, Henry Luce, who owned Time/Life, put him on the cover. 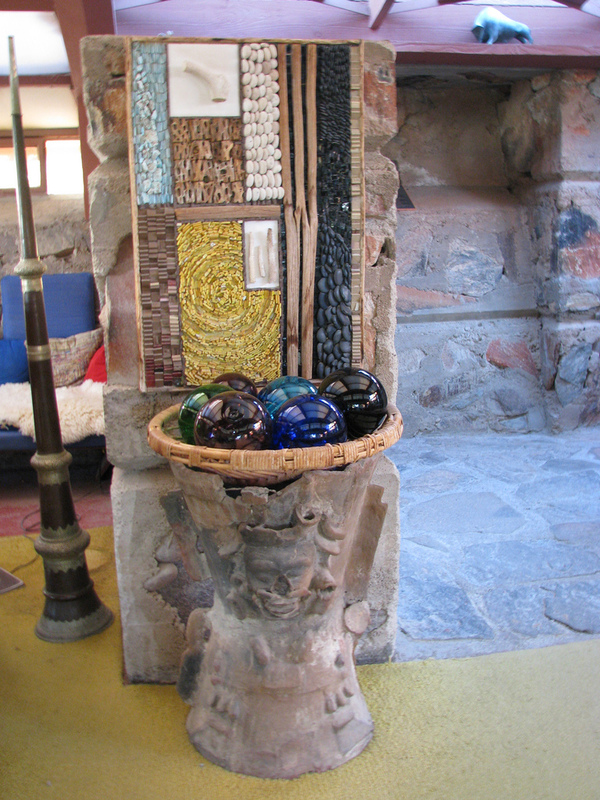 The buildings at Taliesin were originally open to the elements. Wright and his followers would decamp for Wisconsin before the weather got too hot, storing all of the furniture in the Kiva (a windowless room used to show movies). 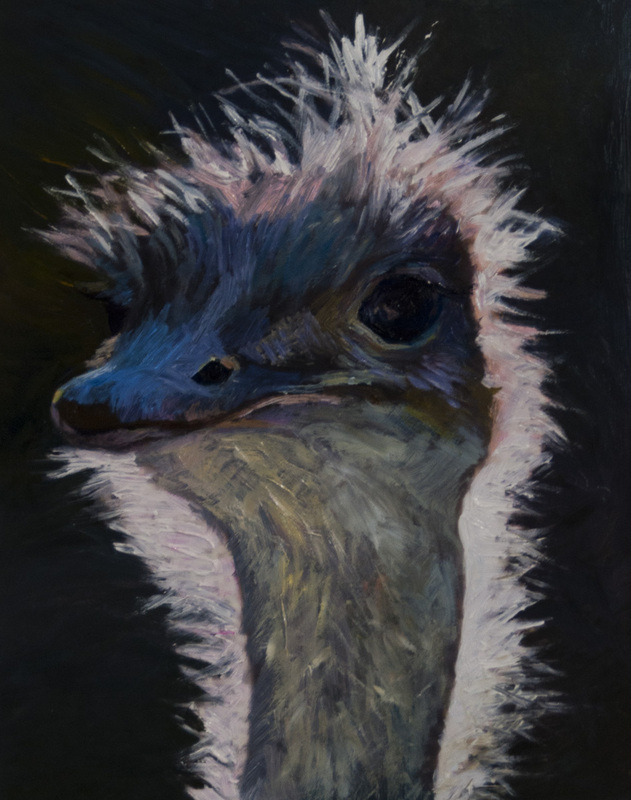 In the fall they’d return, having to clean out the packrat nests and sand from dust storms. Finally windows were installed, but Wright refused to move one of his vases, so the window was cut out around it. (My photo.) I just love these details. Don’t you? 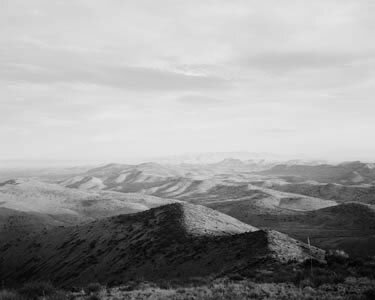 Taliesin is now surrounded by the McDowell Sonoran Preserve of 21,400 acres, preserving the view that Wright loved. Today’s news: JPMorgan Chase bet on credit derivatives that cost the bank $6.2 billion in nine months. Because of that, the company’s board has cut the CEO’s compensation in half, to just over $11 million. 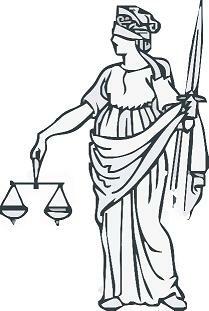 Haven’t heard anything since October about the New York Attorney General suit against JPMorgan Chase.